People who migrate are really the people who are mostly responsible for the problems in their countries, they want stuff, and when they don't get it, they throw a fit or find another host to be parasites on. We may need a sticky of the growing list of those countries who REFUSE to sign this UN Migration Pact. Sign the "PACK THEM UP AND SHIP THEM OUT" Pact! The co-leader of opposition party Alternative for Germany (AfD) has lashed out at the German government and their stance on the UN Global Compact on Migration. He said his party he urges the government not to sign the document as it isn’t in the interest of the German people. “If this Global Compact is just a political declaration, which has no consequences for the national parliaments and the law then why are we seeing resistance from everywhere on the rise against it, all of a sudden?” Gauland says. According to the AfD leader, “The interests of the receiving society are left completely unmentioned” and “the document will supersede national law”. “We pledge to fulfil the goals mentioned in the global pact and obligations in accordance to our vision and our guiding principles”, it is so written there. The wording alone “we pledge” appears dozens of times in the paper, Gauland continues. He adds that the document can lead to migrants being encouraged to come and claim benefits as a human right. “For example we pledge, that all migrants notwithstanding their migration status are able to exercise their human rights through a safe entry to standard benefits. Less sensitive people call this migration into the social benefits systems. “The milestone this pact talks about lies in the way of the betrayal of sovereignty of our nation. Millions of people from crisis regions are encouraged to hit the trail. “Left dreamers and globalist elites want to secretly transform our country from a national state into a settlement region. The government of the Czech Republic has decided it will not join the United Nations Global Compact for Migration. Czech Prime Minister Andrej Babiš and his Deputy PM have confirmed this today. “The Czech Republic has long favoured the principle of separating legal and illegal migration,” Deputy Prime Minister Richard Brabec said at a press conference. “There are issues that can be interpreted in various ways. I will be proposing to my partners in government that we act in the same way as Austria or Hungary,” Babiš then said. The Czechs follow in the footsteps of the United States, Hungary, Australia, Bulgaria and Austria. Implement the "Chain Deportation Pact". Load them up and send them all home! Angela Merkel has called for the creation of a “real, true EU army”, days after stating that only through globalism can the world see peace. 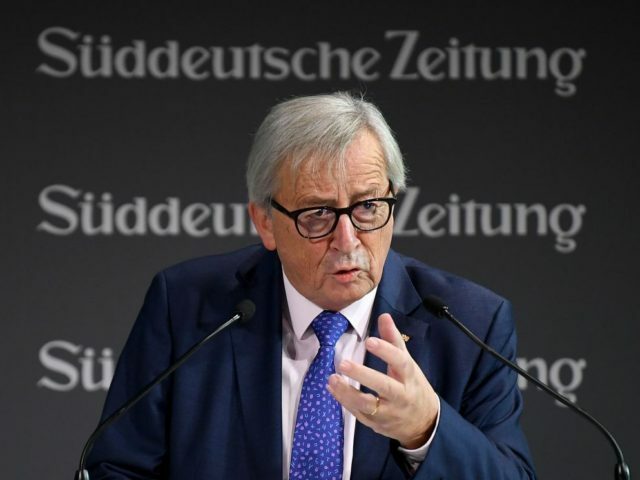 Juncker confirmed the EU is opening legal pathways for migrants, declaring that Europe has a “clear need” for mass migration from Africa. It is their President's responsibility to take care of their citizens...send them ALL back! Dumping billions of people all across the world is stupid! After Hungary, Austria, the Czech Republic and Bulgaria, Estonia has also left the UN migration pact. “In forming the governing coalition, we agreed that we make decisions only by consensus. The government has today failed to reach agreement at the Cabinet meeting on support for the UN migration pact. Therefore, the government will not join the agreement, “wrote Prime Minister Jüri Ratas (Center Party) on Thursday on Facebook. The comprehensive management of immigration is important for all countries, emphasised Ratas. However, the laws of Estonia are already in line with democratic and European principles. This also applies to the future. For the past two years, Estonia has been governed by a tripartite coalition of Social Democrats and Conservatives (Isamaa, Fatherland) led by the Center Party. While the Social Democrats were in favor of Estonia joining the UN migration pact, the conservative party rejected support for the agreement. Estonia is the fifth EU state to exit the UN migration pact. Previously, Hungary had already rejected the agreement. A little later, Austria, the Czech Republic and Bulgaria withdrew from the pact.